You’ve been told to break out of your comfort zone — here’s how to actually do it. You’ve definitely been told at various points in your life that you need to break out of your comfort zone. Maybe you’ve been at a restaurant and have been nervous to try a new dish, or you’ve been in the same position at the same job for way too many years, and now it’s time for a change. In any of these cases, it’s probably time to break out in order to really succeed. Beyond discovering tasty exotic food, studies show that stepping out of your comfort zone leads to greatly increased productivity, creativity, and the ability to cope with unexpected changes and further your success. When you’re sweating bullets and are so terrified that you can barely function, stepping outside your comfort zone is anything but productive. Taking a leap of faith can be downright intimidating. 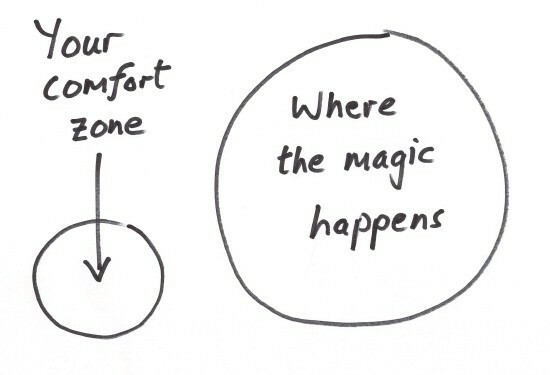 After all, our comfort zone has the word “comfort” in it for a reason. In fact, that’s the reason many of us avoid stepping outside this zone — we’ve heard a million times over that it’s great for us, but it feels absolutely awful in practice. Thankfully, science has an answer. A study conducted way back in 1908 by two psychologists showed that remaining in a state of comfort ensured steady performance (sounds about right). However, in order to increase or maximize performance levels, we need to be in a space of “optimal anxiety”. This is where we benefit from a little bit of fear. Challenging yourself in this place can allow you to accomplish incredible things. Think of a mountain climber; when they begin climbing mountains they don’t start with Everest. They start with smaller peaks until they build up a tolerance. Once that tolerance is reached, the climber will plateau and achieve a steady state of performance, then destroy that tolerance until they reach the peak. You easily can do this too by reaching your “optimal anxiety” — that Goldilocks level where you achieve maximum productivity and continually push your boundaries. Even US Olympians and Navy SEALs rely on baby-steps to achieve their huge goals and step out of their comfort zones. That’s because Harvard research suggests that breaking down your goals into tiny, daily steps is the easiest way to reach those huge successes. Rather than jumping into the deep end (literally or figuratively), take a few steps out of the shallow end today. If you’re thinking of opening a business, for instance, Forbes suggests you “interview one business owner.” Before you know it, you’ll have taken huge leaps and your comfort zone will be a faraway distant memory. If you’re not sure where to take baby-steps, take a page from Rometty and be curious. Everything from a new cooking class to attending a conference at work is a great step towards an optimized destruction of your comfort zone.That’s not to mention how being curious and learning new things has attributed to the success of numerous moguls, including Bill Gates and Oprah Winfrey. Once you start stepping out and gaining new success (and fun experiences), you’ll realize your comfort zone isn’t so comfortable after all. Roosevelt was right on the money. Think back to the NYT suggestion: is there something that you’ve been putting off because it brings butterflies to your stomach? Is there a slight fear you have, but you know you’ll be more productive by moving towards it? Whether it’s going to that job interview or just saying “hi” to someone you want to meet, make an effort to do it daily, knowing that it will be a step towards conquering your fears and success goals. As Sheryl Sandberg put it, “we hold ourselves back in ways both big and small, by lacking self-confidence, by not raising our hands, and by pulling back when we should be leaning in”. I am not saying this is easy, and its certainly easier to write about than to put into action, but it’s the only way to make changes on a daily basis that affect our lives for the better. You may also fail at first, but if you stay in the “scary” place of optimal anxiety, you may find yourself taking important risks that you never thought you would do. Truly successful people believe in the power of this fear, and they never stay in the comfort zone. We may not be aware of how locked in the comfort zone we actually are. The more we risk in the right ways, the more we succeed. If you liked this piece, connect with me at my website for more tips or follow me on Medium. If you have any tips for breaking out of the comfort zone, give me a shout-out!